Singapore! 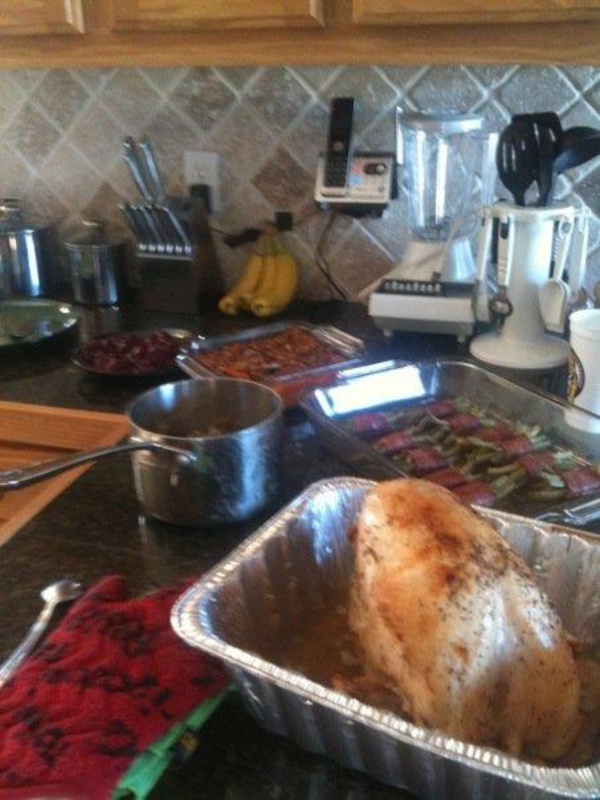 Day 3 – Steve Made Thanksgiving Happen! We got a late start today, and as we were walking to grab lunch, Steve asked if I would like to have Thanksgiving dinner. The last time we had Thanksgiving dinner together, I cooked the meal at his place in Baton Rouge, LA. We had a pretty fun adventure grocery shopping and shopping for the “tools” necessary to make a proper meal. And, the meal turned out pretty well, as Steve will attest. Here’s a picture from the last time Steve and I had Thanksgiving dinner together. His kitchen isn’t a bad one in which to work! 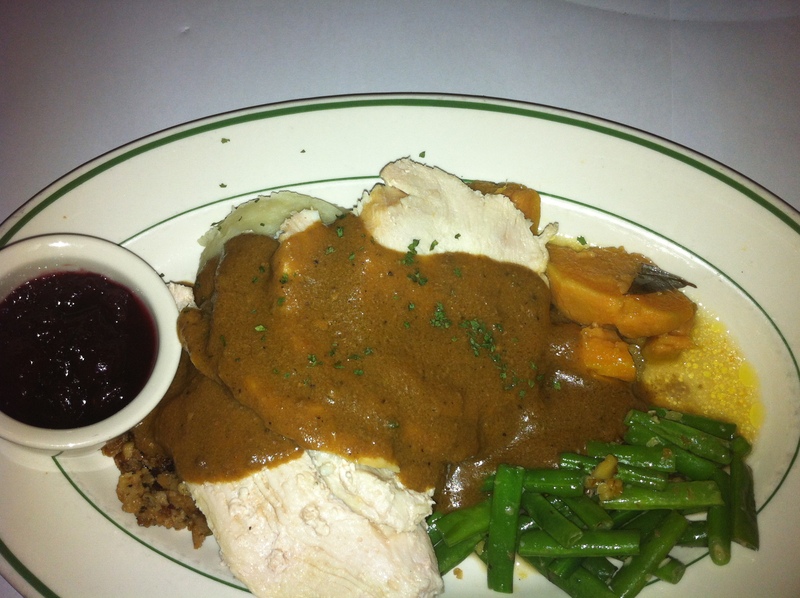 Tonight, we decided to head over to Dan Ryan’s Chicago Grill for a four-course turkey dinner. 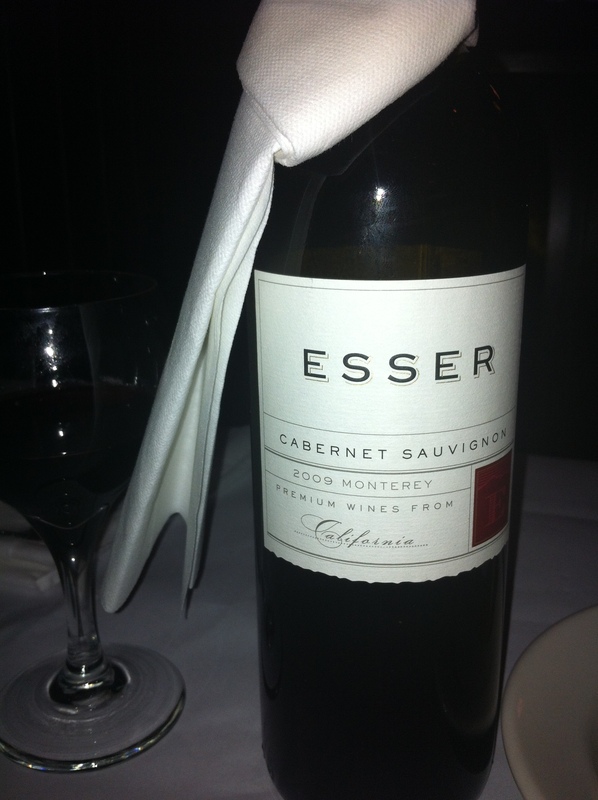 We paired the dinner with another bottle of Cabernet Sauvignon. Not quite as good as the bottle we shared the other night, but still a nice wine. 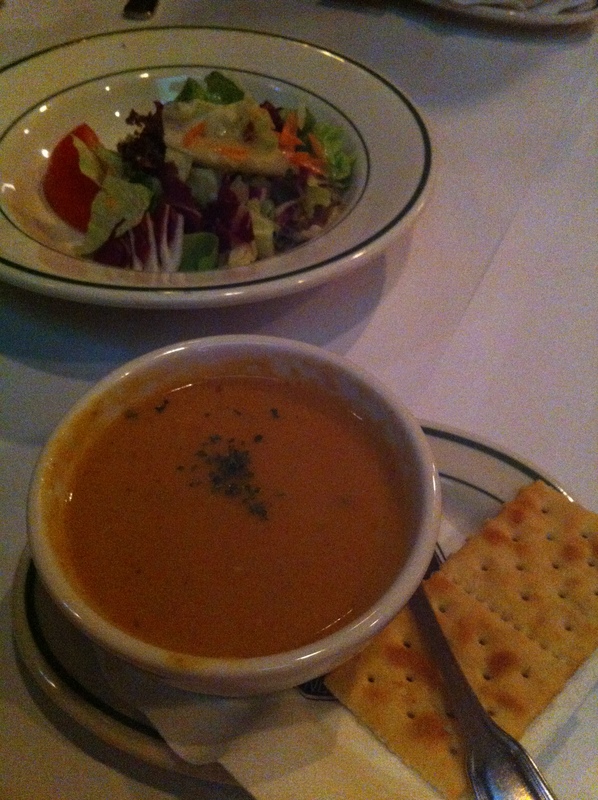 First, we were served pumpkin soup and a house salad. Neither had much flavor, but both were easy enough to eat. Then came the grandaddy of them all! The turkey dinner. I’m talking about enough food to feed a family of four! And, with each bite, Steve and I discovered more and more food on our plates. The green beans were delicious – crispy and flavorful, the turkey was tender and moist, the stuffing had a good, hearty flavor, the mashed potatoes were cooked perfectly, the cranberry sauce had a good texture and tart bite to it, and the yams were nice and tender. Mind you, I only had a couple of bites of each, and had the server “pack it” for “take away” (aka: leftovers). We finished with “pumpkin” pie. I put that in quotations because Steve and I each had one bite of the pie, scrunched our noses and tried to figure out what was wrong with the pie. 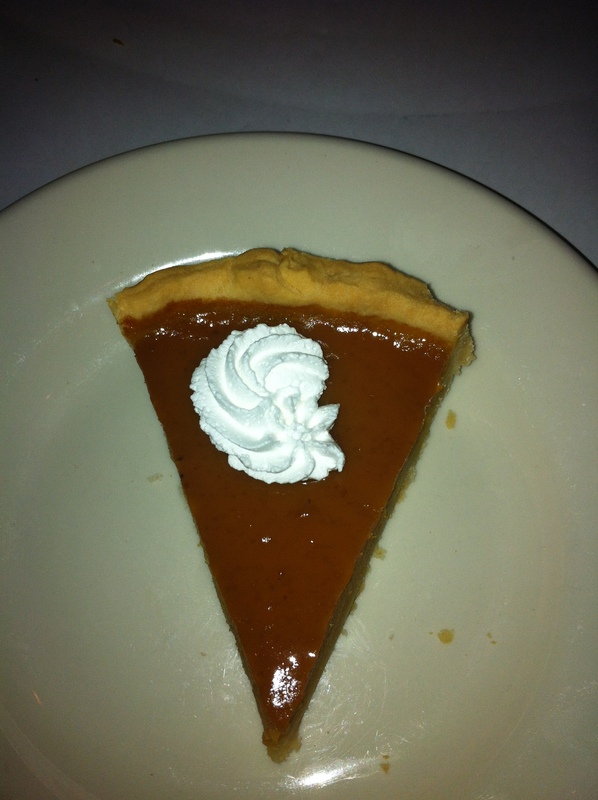 My assessment…it was sweet potato pie, not pumpkin pie. I only had the one bite, but once Steve finished his piece, he agreed…not pumpkin, but likely sweet potato pie. Later, as we continued chatting and finishing our wine, we laughed at the reactions of other patrons as they bit into their desserts. So many funny and perplexed faces. Some folks even checked the tent card to verify that they were supposed to be getting pumpkin pie. At least we weren’t alone in turning our noses up at the pie. My mission now is to find Steve pumpkin pie – because he was VERY excited to have a slice and didn’t get one. If I can’t find, or make one, I’ll likely make my famous orange juice cake again. He became a big fan of that cake during the last Thanksgiving we had together. Can’t blame him…it’s good stuff! Now, I know I’m going backward here, but I’ll share what we had for lunch as well. As I mentioned, it was late, so Steve thought it would be a great time to check out a hawker station. There were two reasons for this: 1) it provides a variety of ethnic options, and more importantly, 2) nothing else was open at the time! We did one lap to check out all of the options (SO MANY OPTIONS! ), and then circled back to order. We could choose from duck, ramen, Indian cuisine, Dim Sum, or fruit, etc. I chose to get traditional Chinese food – 1 meat, 2 veggies. 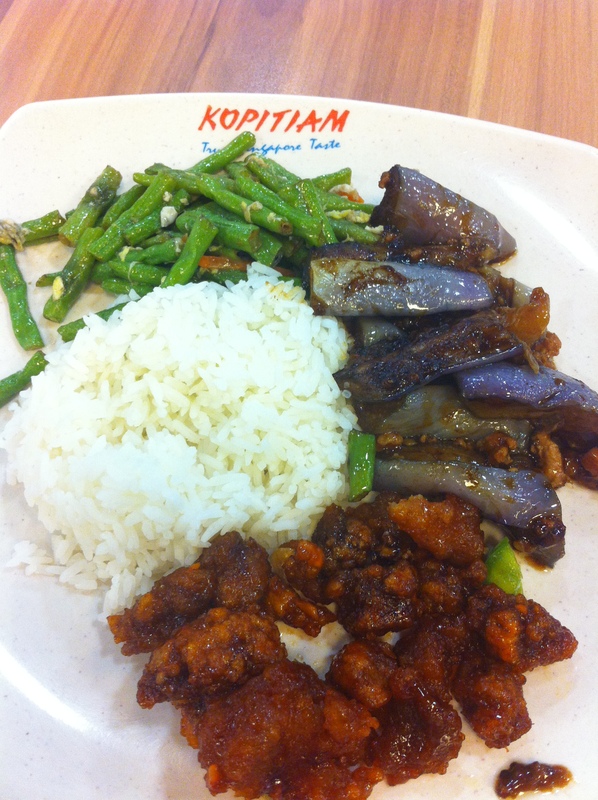 I got a spicy fried chicken with spicy garlic green beans (which actually were not very spicy) and eggplant. The green beans were tasty, as was the eggplant (though I didn’t like the mushy texture of the eggplant), and the chicken was fine. Nothing to write home about, but it did the trick! We also stopped to get freshly juiced fruit juice. I was served a mango/pineapple drink. Very refreshing! 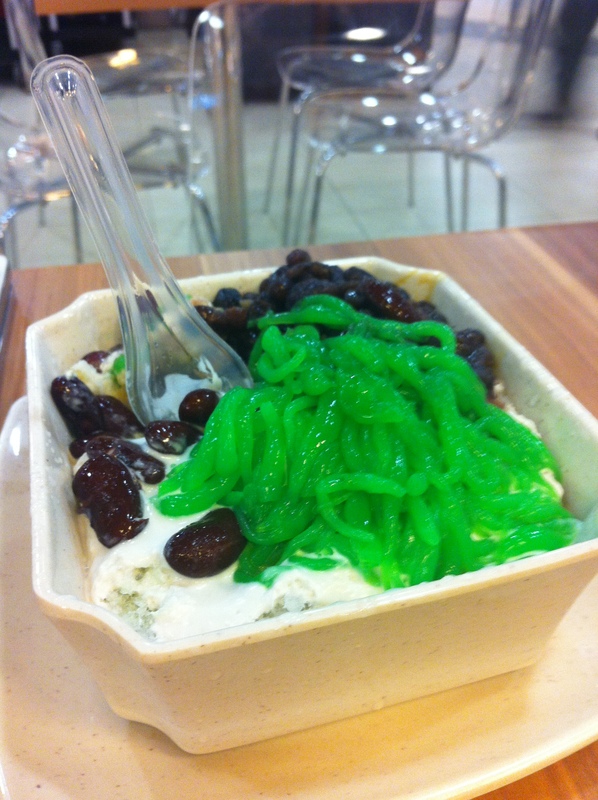 And, Steve chose Cendol, both because he really likes it, and so I could try another “staple”. This place served it as more of a dessert, rather than as a drink like many other places serve it. 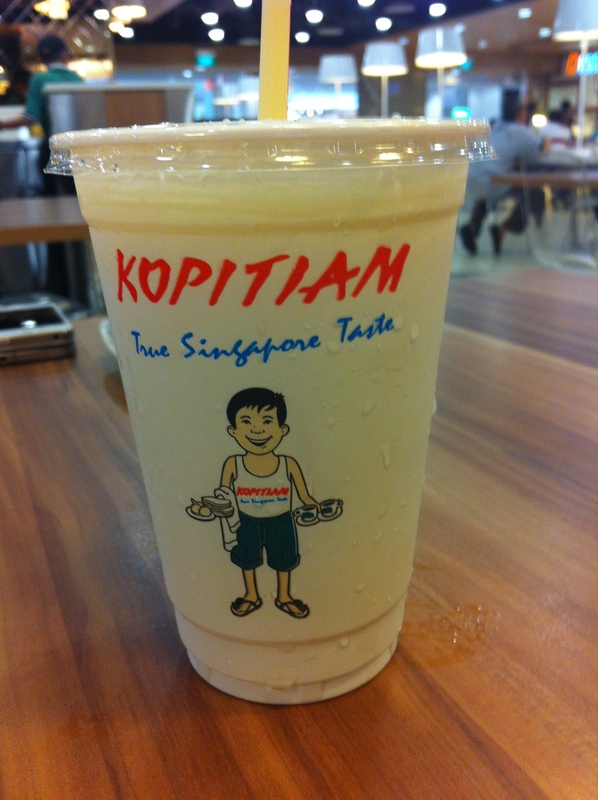 With the coconut milk and shaved ice, it was also very refreshing! So, while I missed seeing my family on Thanksgiving (and cooking up a storm), and I miss my dogs, I’m very grateful to have the opportunities in life that I have. I’m also very grateful that I’ve been able to keep Steve as a friend in my life for 16 years now! Thanksgiving (obviously!) 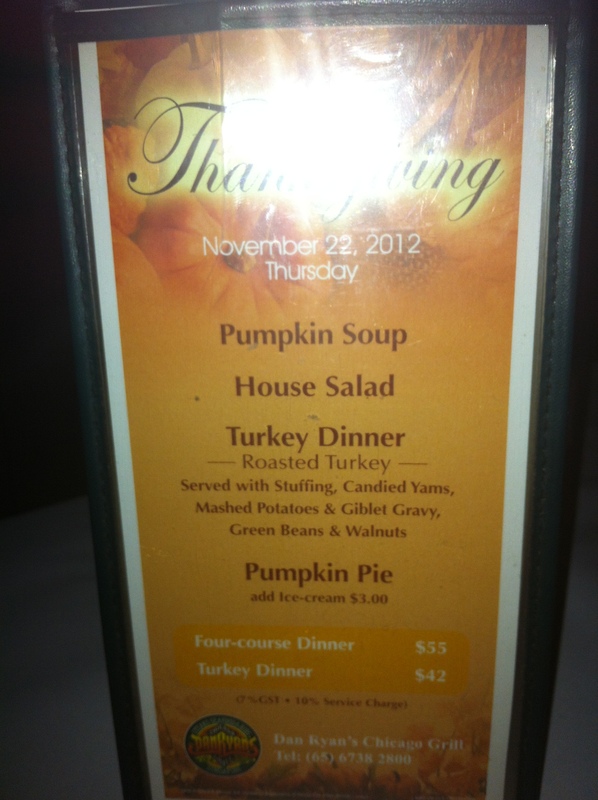 is not a big holiday in Singapore, but Steve made Thanksgiving dinner happen, and we both thoroughly enjoyed it!